We took a slight detour from the ten plagues of Exodus, to take a look at the life cycle of frogs, with Wendy Pfeffer's book, from the Let's-Read-And-Find-Out Science series, and a cut, and glue craft from DLTK. Pfeffer's story is a Stage 1 book, so the explanations are simple, and not overly detailed (a fact I was grateful for when it came to the male frog fertilizing the eggs). And, it goes perfectly with the frog life cycle printout from DLTK. The girls glued their cutout frogs, tadpoles, and eggs, with accompanying arrows, to constructions paper ponds, and lily pads. Then, they drew on trees, and a few snakes, and birds (poor tadpoles). For more story stretching arts, and crafts, check out this week's story+ART link up, at A Mommy's Adventures. Last spring our neighbors showed my daughter some tadpoles swimming in their pond. She was fascinated. This looks like a good, simple book for younger kids. We own another, but it is just a little too detailed to hold her interest. Great project from a science book, I like how your girls extended it by drawing. I liked most of Stage 1 of LRAFO books that we tried. This week we had one on clouds, and it was way too complex with all those long cloud names. I wish we could actually see a frog - I don't believe Anna really knows how they look like since we live in an urban area without ponds nearby. :) Not too far of a detour! I don't think the plague of frogs were as cute as your girls' drawings, however. Great way to combine science and art! I love a great science book--this looks like a fun project, too. That is so cute! I remember doing something similar with Emily last year when we visited a pond at our local nature center. Great idea!! I like the Let's-Read-And-Find-Out Science series I used them in my classroom when I was teaching. Great activity to go along with the book. I am now following your blog. They do have some awesome books. I'm amused because I was thinking about doing a frog project for next week. We love this book series, I will have to check out this one since Emily loves everything and anything that has to do with Frogs right now :0) I love the project too!! Thank you for linking up your project to stART!! I love the girl's illustrations of the life cycle of a frog! 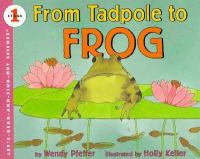 We did a tadpole unit last year with that same book... I love those books! We even found real tadpoles and raised baby frogs... a couple little frogs escaped... I guess the cats maybe ate them... or maybe they are still roaming the house... ha ha! ribbit.. ribbit. I like the cycle that you created! We are going to try and find some tadpoles to put in our aquarium this summer. There's Iron In Our Cereal, or Success At Last!